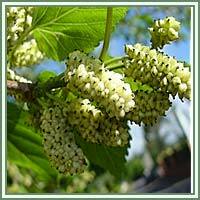 Habitat: White Mulberry is native to China. It grows well on a wide variety of soils, but prefers a moist, well drained soil with lots of sun. 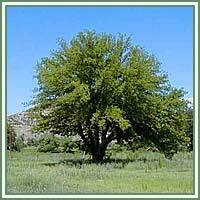 Description: White Mulberry is a deciduous tree growing over 20 m in height. In its cultivated form, it is pruned to a low-growing shrub. It has a light brown to gray bark, smooth and divided into narrow, scaly ridges. The leaves are glossy and light green, alternately arranged and cordate at the base, but very variable in form. They can vary from unlobed to palmate, even on the same tree. Flowers hang on short, pendulous catkins. They are small and greenish in color. When the flowers are pollinated, they are transformed into a berry-like, collective fruit. Fruit varies in color, from white, lavender to even black. Parts used: Fruit, leaves, stems, bark. Medicinal use: White Mulberry is considered to be antibacterial, astringent, diaphoretic, hypoglycaemic, odontalgic, and ophthalmic. Its leaves are usually used in treatments of colds, sore throats, flu, eye infections and nosebleeds. Recent researches in Japan showed that leaves contain substances that inhibit intestinal enzymes from passing sugar into the bloodstream. Leaves extract could inhibit the oxidation of LDL- cholesterol, act as a carbohydrate blocker and reduce the concentration of the arterial plaque. With these actions, the possibility of stroke is greatly diminished. Stem is very beneficial in cases of rheumatic pains, spasms and high blood pressure. A tincture made from the bark can easily relieve toothache. The fruit is used in the treatment of urinary incontinence, diabetes, dizziness, tinnitus and hypertension. It is also a mild laxative and can be applied in cases of constipation. Safety: Some herbs could react with certain medication. Therefore, it is advisable to consult your doctor before consumption of any herb.